132 minute running time including credits, so at least 30 minutes too long. 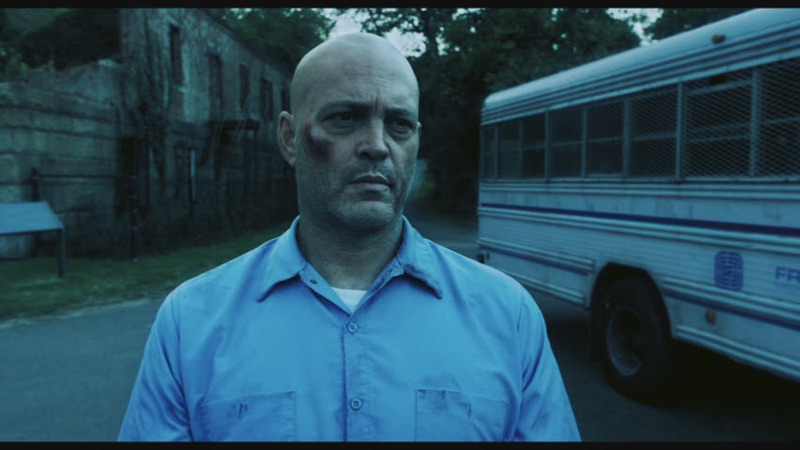 Vince Vaughn with fake southern accent and shaved head. He has never been able to act, but it doesn't matter here since he just keeps a blank face and delivers his lines in a consistently clipped way. It's a Tarantino wannabe movie. Ultra-violence combined with goofy humor. There is a funny opening scene where he beats up his wife's car. His wife is Dexter's foul-mouthed sister, Deb. Vince is running drugs and gets caught and goes to prison. His wife is kidnapped so he has to get himself transferred from a medium security prison to a maximum security prison to kill a guy to get his wife freed (yeah, it's a dumb story). Vince is tall and not fat, but he's not in any shape to fight like he does in this movie, it's just silly. The movie became completely ridiculous when Don Johnson appeared (in sunglasses and leather gloves) to reprise his Big Daddy role, though this time as a prison warden instead of a slave owner. Tarantino-lite. If you were a certain kind of teenage boy, you'd like this movie. Everyone else should steer clear.